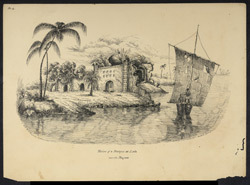 Pen and ink drawing by Frederic Peter Layard (1818-1891), after an earlier sketch of January 1834, of the ruins of a Mosque on the banks of the Meghna river in Bangladesh, dated 1842. The image is inscribed 'F.P. Layard. Sukkur 1842. Sketched Janry 21st 1834'. The Meghna is the great estuary of the Bengal delta, taking the waters of the Ganges and Brahmaputra rivers to the sea.